Nestled on the edge of the friendly neighborhood, La Gloria, Casitas del Mar offers you the opportunity to experience the welcoming local ambiance. Collect beautiful shells and sea glass as you stroll along the rocky and sandy shore or relax on the patio as you watch the world, and perhaps a few dolphins, go by. 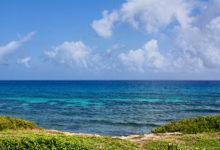 Oceanfront and ideally located mid-island, you have easy access to all island sites by walking or a quick, inexpensive taxi ride. It’s the best of both worlds! There is a full service grocery store, laundry service, and several neighborhood restaurants, all within easy walking distance. 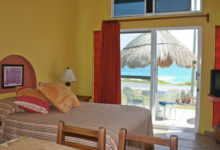 Perfect for singles, couples or groups of friends, each of the 4 suites at Casitas del Mar has been tastefully decorated with a Mexican flair. 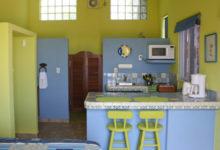 Your Canadian hosts, Joyce and Bob (Isla residents since 1993), have carefully equipped each suite with everything you need to make you feel at home. As an owner of travel agencies in Windsor, Ontario, Bob was always interested in unique destinations. When he first came to Isla Mujeres, Mexico in May 1988, he was impressed with the turquoise Caribbean Sea, the pure, white-sand beaches and the laid back, friendly attitude of the islanders. By September, Bob had invested in property at Nautibeach Condominiums on North Beach. 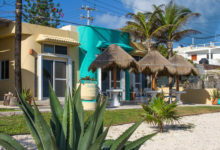 He reasoned that it would be easy to sell clients trying to escape Ontario winters on the idea of a 3-hour flight to Cancun, with Isla as the final destination. Less than ten days after he closed on his new property Hurricane Gilbert, one of the most powerful hurricanes ever recorded, struck and tourism ground to a halt for the next two years. I (Joyce) was born and raised in Saskatchewan but was living in Winnipeg in 1989 when I met Bob. Bob mentioned flying to a small island near Cancun and I remember thinking, “I’ve read about men like you.” A few months later, on my first visit to Isla, I, too, became smitten. We came back every chance we could. We were true “Islaholics”. 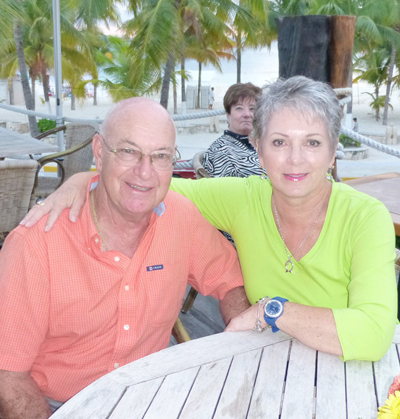 In 1993, shortly after we were married, we moved to Isla Mujeres and Bob became the administrator at Nautibeach Condos. The job lasted only six months but we stayed on and started our own rental business. It didn’t take long for each of us to find our niche. I have always handled the communications and reservations while Bob handles the legal matters and is my main(tenance) man. The business at Nautibeach grew, and to escape being on duty 24 hours a day, we purchased the property where we currently reside. 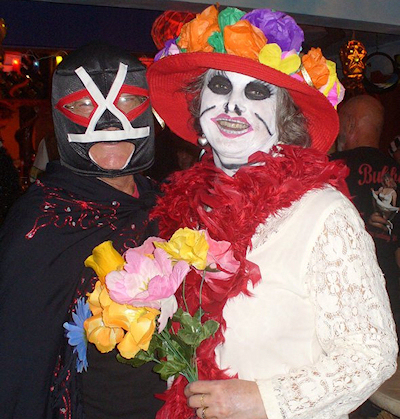 A few years later, we expanded and built Casitas del Mar. By 2006, we sold our remaining interests in Nautibeach and now find ourselves pleasantly occupied with renting and maintaining our little piece of paradise. A few years ago we resumed our Canadian residency and now spend six months near our family and the rest of the year here on Isla. We really do have the best of both worlds.